Comparisons with 'Baahubali: The Conclusion' is certain to happen whenever a Bollywood biggie releases from now onwards. Salman Khan-starrer 'Tube Light' is releasing on June 2rd on the eve of Eid. As per stats, 'Baahubali 2' released in around 9,000 screens across the World. Whereas, 'Tube Light' managed to get anywhere 9,500 to 10,000 screens Worldwide. 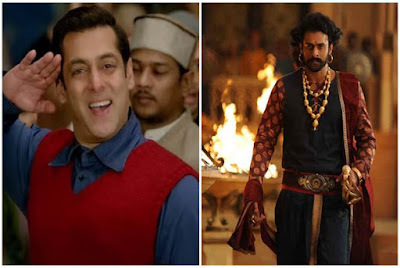 That's the first record of the Prabhas-starrer broken by Salman Khan. However, Salman Khan believes 'Tube Light' willn't be breaking any of the other records of 'Baahubali 2'. When media drew comparison between both the movies, The 'Sultan' Star made it clear he isn't aiming to break any of the records of the War Drama. 'I just want none of the people involved in 'Tube Light' business incur losses,' he clarified. Has Salman Khan played it safe? or Should we assume records hardly matters to him? One thing is for sure, 'Tube Light' can't break the highest grosser record (Hindi - Domestic Market) set by 'Baahubali 2'.